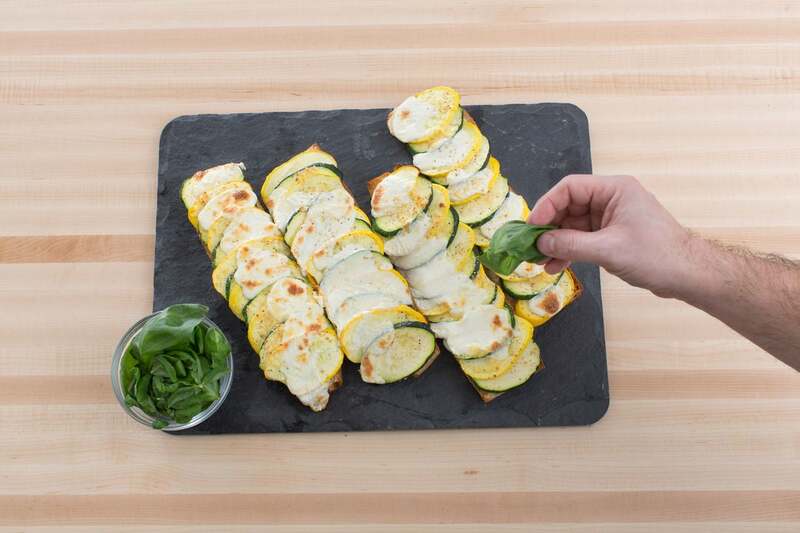 Summer Squash Baguette Pizzas Fill 1 Created with Sketch. In this recipe, we’re making pizza night incredibly easy by using baguettes. 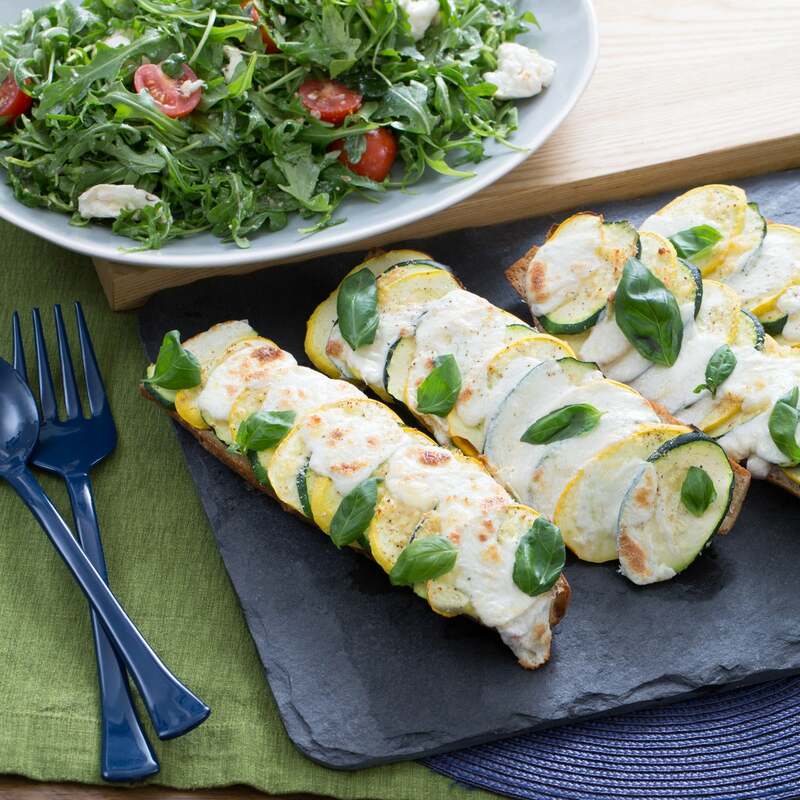 French bread pizzas are simply personal pizzas made on baguettes instead of traditional dough, and they’re a quick and tasty way to revamp the classic entrée. Crunchy and flaky, our gourmet version features sliced zucchini and yellow squash (two of our favorite summer vegetables), roasted atop a creamy garlic spread with Parmesan and mozzarella. 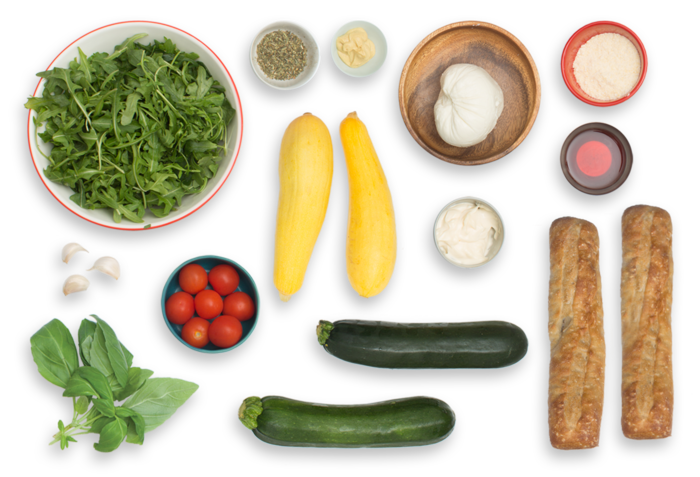 On the side, we’re serving up a salad of arugula, mozzarella and the season’s first cherry tomatoes. 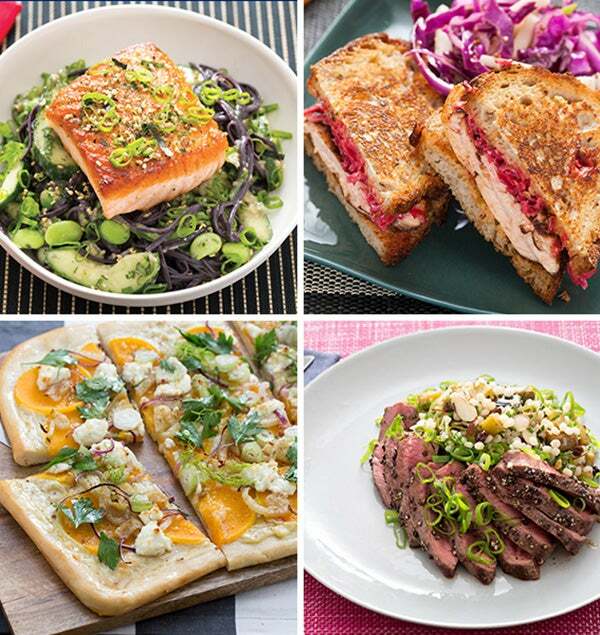 Feel free to use some of the tangy vinaigrette to top the pizzas! Preheat the oven to 450°F. Wash and dry the fresh produce. 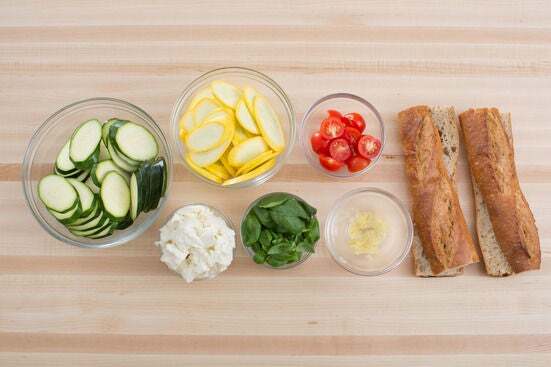 Halve the baguettes horizontally. Tear the mozzarella cheese into bite-sized pieces. Halve the cherry tomatoes. 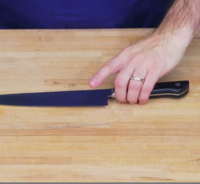 Peel and mince the garlic; using the flat side of your knife, smash until it resembles a paste. 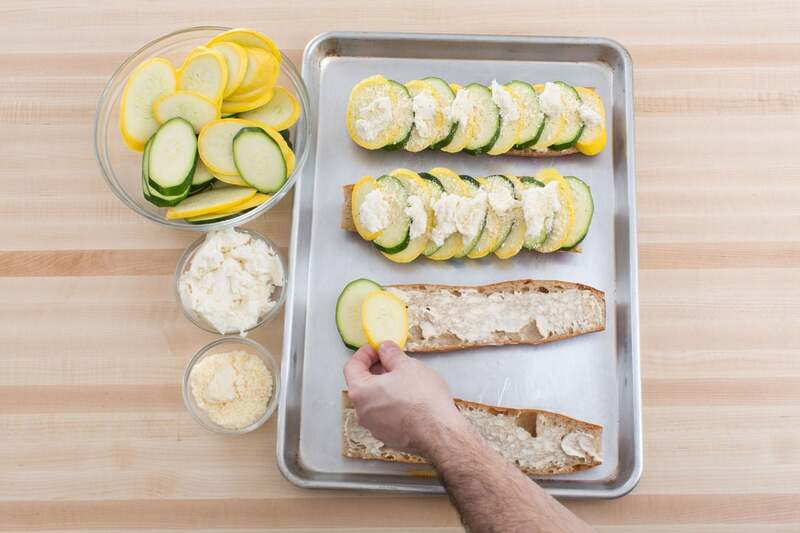 Trim off and discard the ends of the zucchinis and squash; thinly slice into rounds on an angle. Pick the basil leaves off the stems; discard the stems. In a small bowl, combine the mayonnaise and garlic paste; season with salt and pepper. Place the baguette halves on a sheet pan, cut sides up. Spread with the mayonnaise-garlic paste mixture. Top with alternating, overlapping slices of the zucchinis and squash. Top with half the mozzarella cheese and half the Parmesan cheese; season with salt and pepper. 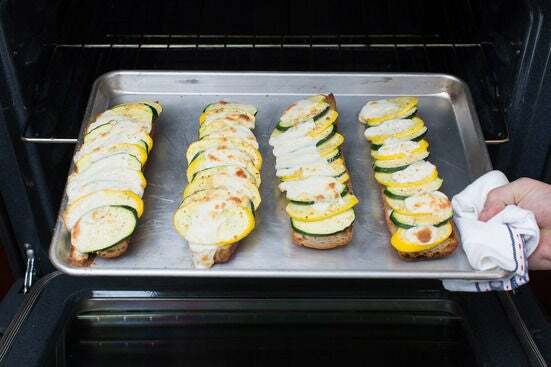 Place the sheet pan of assembled pizzas in the oven and bake 18 to 20 minutes, or until the mozzarella cheese is melted and lightly browned and the zucchinis and squash are tender. Remove from the oven and transfer to a serving dish. While the pizzas bake, in a medium bowl, combine the mustard, vinegar, Italian seasoning and remaining Parmesan cheese; season with salt and pepper. Slowly whisk in 3 tablespoons of olive oil until well combined. 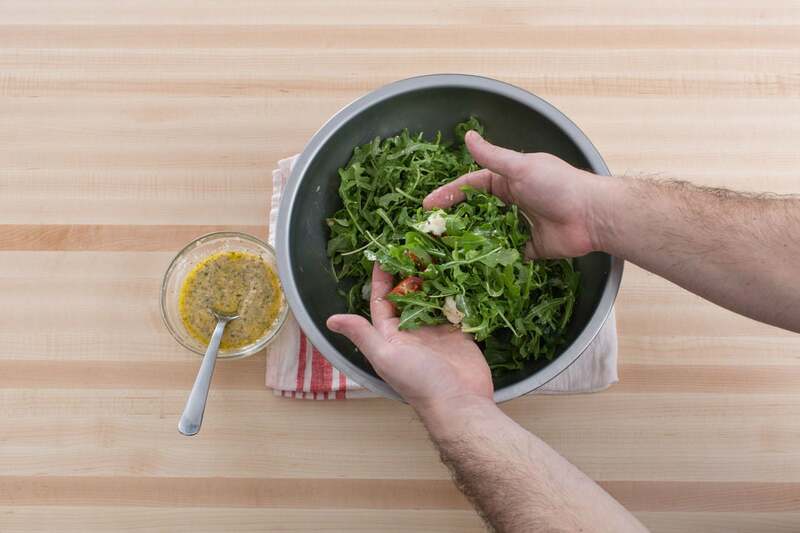 In a large bowl, combine the arugula, cherry tomatoes and remaining mozzarella cheese; season with salt and pepper. 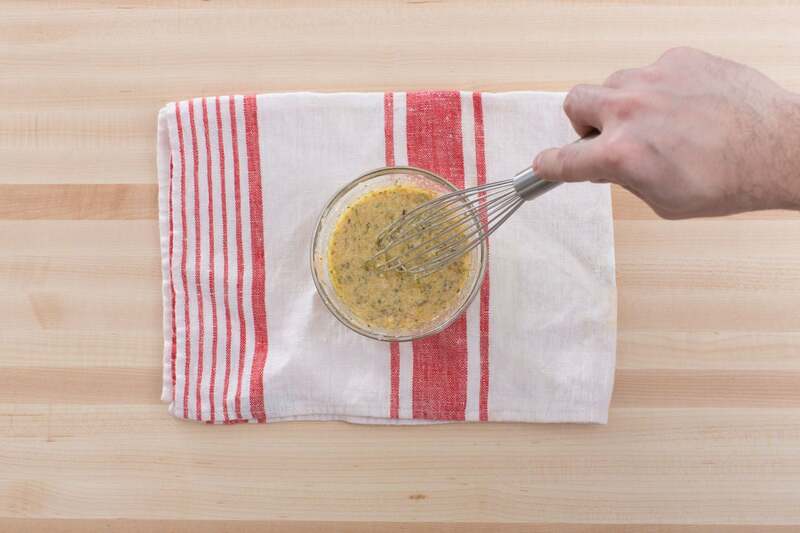 Add enough of the vinaigrette to coat the salad (you will have extra vinaigrette); toss to coat and season with salt and pepper to taste. Transfer to a serving dish. Garnish the baked pizzas with the basil. 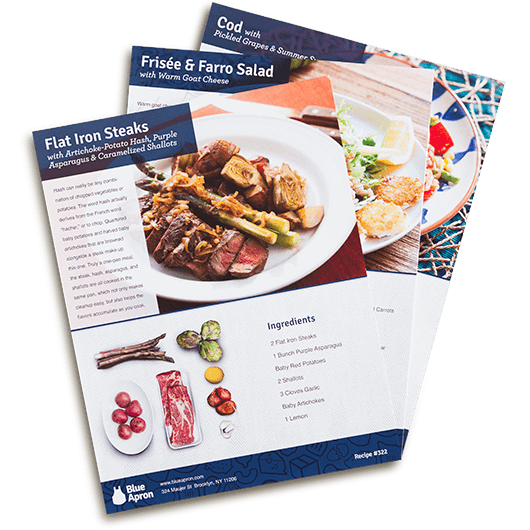 Serve with the salad and remaining vinaigrette on the side. Enjoy!